Our technologically advanced, urban greenhouses yield a year-round, local supply of premium quality produce grown under the highest standards of food safety and environmental sustainability. Our flagship greenhouse, built in 2011, was the first ever commercial scale greenhouse facility of its kind built in the United States. The rooftop greenhouse, designed, built, owned and operated by Gotham Greens, measures over 15,000 square feet and annually produces over 100,000 pounds of fresh leafy greens. 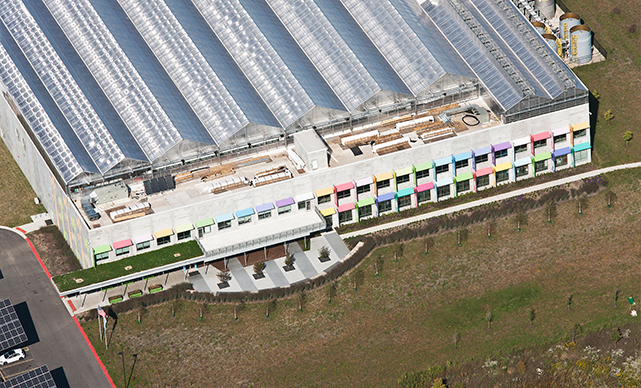 The greenhouse remains one of the most high profile contemporary urban agriculture projects worldwide. Designed and built with sustainability at the forefront, the facilities’ electrical demands are offset by 60kW of on site solar PV panels with high efficiency design features including, LED lighting, advanced glazing, passive ventilation, and thermal curtains, sharply reduce electrical and heating demand. 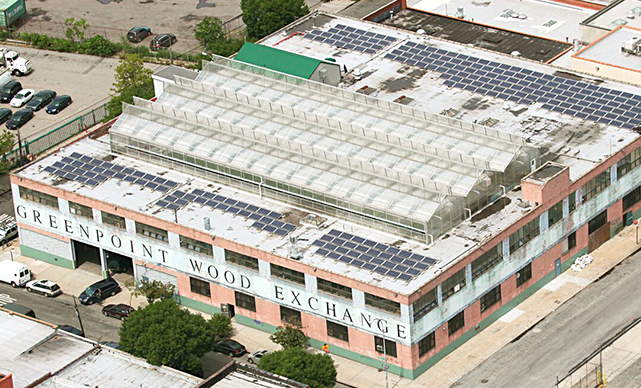 Rooftop integration further reduces energy use while serving to insulate the historic Greenpoint Wood Exchange building, which once housed a bowling alley, below. All produce is grown using recirculating irrigation systems that capture all water for re-use and are free of any harmful chemical pesticides, insecticides or herbicides. The greenhouse employs integrated pest management solutions, including biological controls such as using beneficial insects to prey on harmful pests. 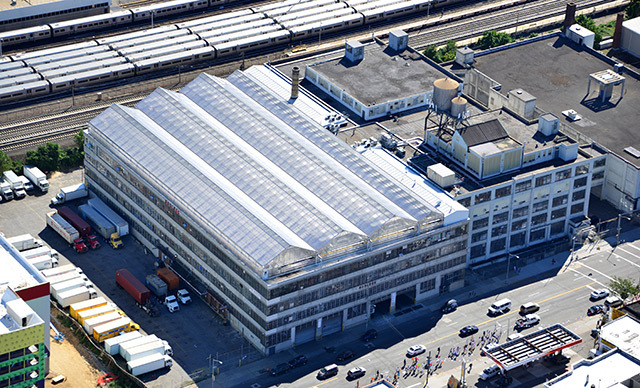 Our Greenpoint greenhouse is proud to be a tenant of the Greenpoint Manufacturing Design Center, a pioneering non-profit industrial developer dedicated to revitalizing Brooklyn’s remaining industrial spaces for small-scale, small-batch, entrepreneurial manufacturing. 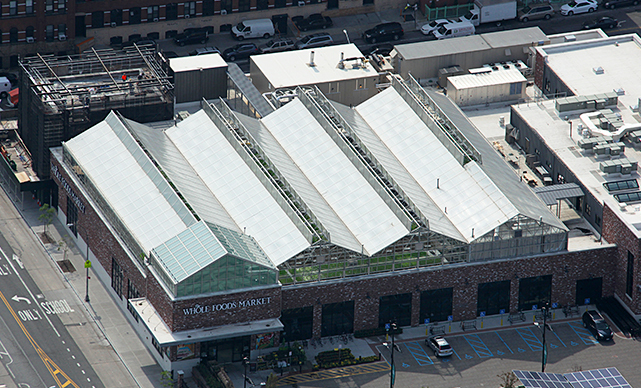 Gotham Greens’ second greenhouse facility was built in 2013 in the Brooklyn neighborhood of Gowanus, on the roof of Whole Foods Market’s first ever Brooklyn store. The rooftop greenhouse, designed, built, owned and operated by Gotham Greens, measures over 20,000 square feet and grows over 200,000 pounds of fresh leafy greens, herbs and tomatoes each year. This groundbreaking project represents the first commercial scale greenhouse farm integrated into a supermarket. Gotham Greens was approached by Whole Foods Market based on its experience and expertise in urban agriculture as well as its dedication to growing the highest quality produce with strong commitment to sustainable agriculture. The partnership with Whole Foods Market was a perfect match for Gotham Greens based on the retailers’ unparalleled leadership and commitment to promoting local, healthy and sustainably produced food. Perhaps the most ecologically advanced supermarket development in the country, the innovative project also features a 157kW Combined Heat and Power (CHP) plant and a 325kW solar PV system located in the parking lot. Amongst other features, both the greenhouse and supermarket implement a high efficiency, zero ozone depletion, HFC-free commercial refrigeration system representing the first HFC-free supermarket store in the United States. Rainwater collection is used for on site irrigation and sink/drain water from the building is treated and reused for toilet flushing. 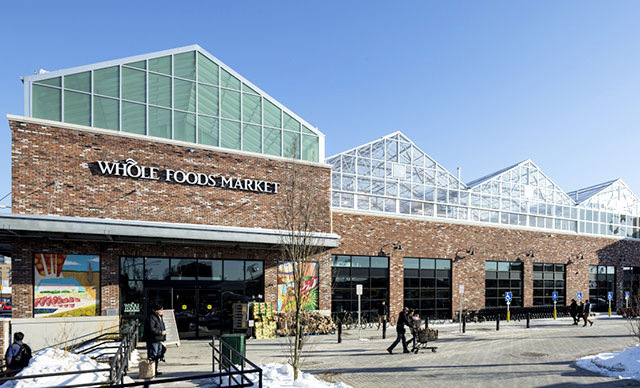 Gotham Greens and Whole Foods Market are thrilled with the project’s capacity to exhibit and educate the public regarding the latest technologies in local food production, sustainable energy, water conservation and re-use. In 1636, Gowanus Bay was the site of the first settlement by Dutch farmers in what is now Brooklyn and Gotham Greens is proud to bring it full circle and be part of the neighborhoods economic and manufacturing revitalization. 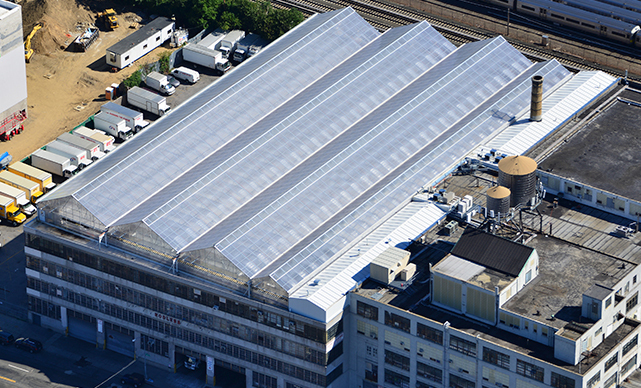 Gotham Greens’ third and largest New York City greenhouse facility is located in the Greater Jamaica neighborhood of Hollis, Queens. Spanning 60,000 square feet, the greenhouse, designed, built and operated by Gotham Greens, was completed in 2015 and grows over 5 million heads of fresh leafy greens each year for the New York City market. The climate controlled greenhouse employs advanced automated greenhouse technologies while demonstrating that urban agriculture can be more than a small scale gardening project but rather a robust food manufacturing business. The 5th story greenhouse facility towers imposingly over the Long Island Railroad to the South and Jamaica Avenue to the North. The greenhouse is built on the historic Ideal Toy Company factory complex first built in 1920. The Ideal Toy Company, best known for creating and marketing the Teddy Bear and the Rubik’s Cube, is part of Hollis’ rich manufacturing history. Hollis is also known as a hotbed of Hip Hop talent, creating iconic artists including Run DMC, Russel Simmons, LL Cool J, Ja Rule, and Young MC. Gotham Greens is proud to employ over 50 full time employees and help put this Queens neighborhood on the urban agriculture map. ‘Urbs in Horto’, latin for “city in a garden”, is the official motto of the City of Chicago adopted when the city was officially incorporated in 1837. With verdant gardens in its heritage, a rich food culture and a thriving urban agriculture scene, the Windy City was the logical location for Gotham Greens’ first expansion out of New York City. It’s a great food town and we’re thrilled to be a part of it. 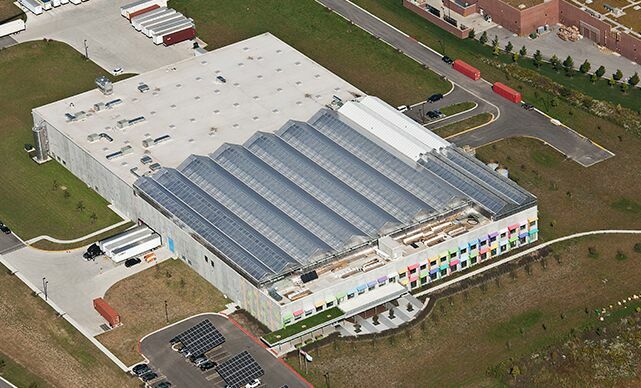 Opened in 2015, our largest and most technologically advanced greenhouse built until date, is located in the Pullman neighborhood of Chicago's south side. Measuring over 75,000 square feet, the greenhouse represents the world’s largest and most productive rooftop farm. Our Pullman facility annually grows up to 10 million heads of leafy greens and herbs, year-round, for the finest retailers and restaurants across the greater Chicagoland area. Spanning nearly two acres, the climate controlled greenhouse facility, owned and operated by Gotham Greens, is located on the second floor rooftop of Method Products manufacturing plant. The unique partnership between Gotham Greens and Method Products, leaders in their respective industries — urban farming and eco-friendly cleaning products — is a groundbreaking vision for the 21st century manufacturing facility. Method’s factory, designed by William McDonough + Partners, is the world's first LEED-Platinum certified manufacturing plant in its industry. Gotham Greens and Method are proud to be contributing to the economic revitalization of the historic Pullman Park district. Located on the far south side of the city, Pullman was one of America’s first model industrial towns built by the Pullman Palace Car Company. The area is a Chicago Landmark district and was recently declared a National Historic Monument. Gotham Greens is a proud supporter of the Greater Chicago Food Depository. The company has built and operates over 170,000 square feet of technologically advanced, urban rooftop greenhouses across 4 facilities in New York City and Chicago. Gotham Greens is actively developing urban agriculture projects in cities across the United States. If you’re a real estate owner, developer, retailer, distributor or architect interested in urban greenhouse development in your city, please feel free to contact us. Tender, delicate and mildly flavored, our specially selected full leaf blend contains various varieties of green, red, oak leaf, butter, curly and textured lettuce. The medley contains high quantities of vitamins A and K, plus important antioxidants beta carotene and lutein.